Ten years ago, 1% of the population gained mutant powers. 1% of the citizens means 1% of the CRIMINALS! You're the cops who clean up the mess. * Ever since the Sudden Mutation Event, people have been able to fly. Phase through walls. Read minds. Shoot bolts of energy from their fingertips. Walk into dreams. * As members of the elite Heightened Crime Investigation Unit, you and your fellow detectives solve crimes involving the city's mutant community. When a mutant power is used to kill, you catch the case. When it's a mutant victim in the chalk outline, you get the call. And when it comes time for a fight, you deploy your own extraordinary abilities to even the odds. * With new human capacity has come new science. Your squad brings forensic science to bear on the solution of mutant crimes. Need to know if a suspect is the victim of mind control or dream observation? Perform an EMAT protocol to detect the telltale signs of external influence. Was your victim killed by a light blast? Use Energy Residue Analysis to match the unique wound pattern to the murderer, as surely as ballistic science links a bullet to a gun. Does your crime scene yield trace evidence of two separate powers? Use your trusty copy of the Quade Diagram, the infallible map of genetic relationships between mutant powers, to tell if one suspect could have used both - or if you have two perps on your hands. * If chases, interrogations and mutant battles weren't enough to handle, you also serve as a bridge between the authorities and your mutant brethren. To successfully close cases, you must navigate the difficult new politics of post-mutation society, and deal with your own personal issues and mutation-caused defects. 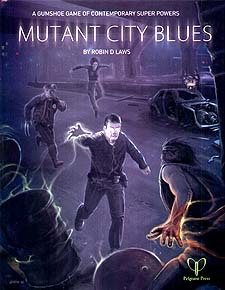 Mutant City Blues runs on GUMSHOE, the acclaimed investigative rules set powering the hit new game Trail of Cthulhu. GUMSHOE offers a simple yet revolutionary method for writing, running and playing mystery scenarios. It ensures fast-flowing play, always giving you the informational puzzle pieces you need to propel your latest case toward its exciting final revelations.